Hannah, who had the better portion of all the narration, is Nate's meddlesome sister. She and her friends use Nate to take a peek into how gay men use online dating/hookup websites. Hannah steals her brother's identity, which leads us to Brandon. I struggled with this book, and it had nothing to do with Nate or Brandon, and everything to do with Hannah. Maybe it was my mood, but the level of frustration didn't lend well to the 'Feel-Good True Romance' vibe. I was rubbed wrong on the unethical, sociopathic actions of Nate's sister. No matter how it was explained away, Hannah's actions weren't palatable for my reading enjoyment. With every chapter, even at the ending, all she was doing was digging a bigger hole. And no, the twisty turn that saved the book from being less than 3 stars, is not quantifiable with Hannah's actions, as Nate tried to explain her actions away, comparing it with his own. Nate's was a business decision – Hannah's was a selfish, spiteful, vengeful, jealous decision, toying with everyone's emotions. This will be the first time I've ever said this, and I will be repeating it for the third book in the Feel-Good True Romance bundle as well. I do not want an F in my MM romance. I've never said that before – I've never even thought it. I don't mind if the entire side cast is made up of females, but they do not get to be 'in' the romance with the males in the book, unless it's ménage, which makes it no longer MM romance. It's a bait and switch. I'm reading a MM romance, which should feature two MALES, with a female taking up the majority of the narration. The frustrating premise of the story, which did make it a page-turner, and not at all feel-good, had a portion of the book's romance during Hannah catfishing Brandon – this removed the foundation of Nate and Brandon's romance, with little to build off of as Hannah kept encroaching on the story. This is MM romance, right? Yet Hannah was not painted as the villainess of the tale. I enjoyed Nate and Brandon, even with miscommunication issue. I read every single word of the book, enjoyed the twist I didn't see coming, but I felt the portrayal of Hannah and her friend lessened the reading enjoyment, painted women in a poor light, and made me think badly of my own gender. I should have written this review prior to reading the entirety of the third book in the bundle, because I fear that tainted my experience after the fact. I enjoy Rick R Reed's writing style, how inventive the plots are, but reading two books back-to-back featuring a female narrator scene-stealing from both love interests and lessening the impact of the romance... It doesn't matter if it's MM or MF, the sole focus should be on the couple. This is an interesting take on a modern problem – with a very interfering sister thrown in for good measure. That said, I think she was suffering from a moment (or two) of madness, as nothing else indicated that she would be so foolish! But if I'd had an opportunity to stop her, I would have taken it. A relationship started on a drunken dating sign up and a continuing evasion of the issue is not the best of starts, but somehow Nate knows he has to turn this around. His time for confessing doesn't rest there, and we get a lovely twist in the tale when he comes completely clean. And it was fun that Brandon discovered a hidden side to himself too – which was super cute and hot at once. An easy story to read, especially if I forgave Hannah and didn't get hung up on her relationship issues. I do enjoy it when I can feel the author sharing something of themselves, and that felt like the case here. 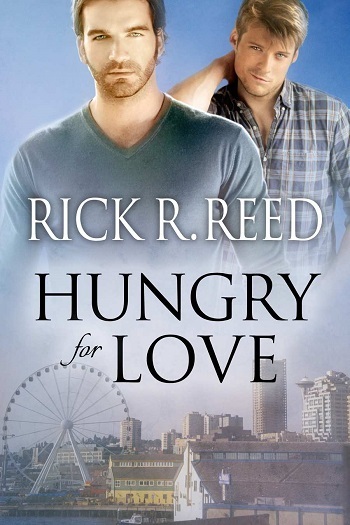 Reviewers on the Wicked Reads Review Team were provided a free copy of Hungry for Love by Rick R. Reed in the Feel-Good True Romance bundle to read and review.